Houzz 440 of our visitors have told a friend about this plan. 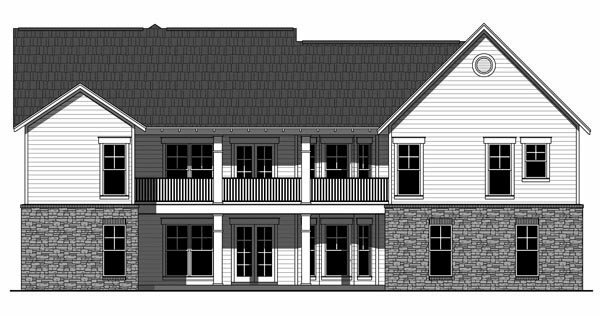 Question: As far as modifying this plan, would it be easily possible to build this house as a one story with just a small crawl space. We love this plan but just as a one story— we want room in our budget to have a shop on property. Thanks! Answer: See plan 55600 for the slab/crawlspace version. We assume you are talking about eliminating the basement level, so the slab or crawlspace foundation type would give you a one level house. Thanks. Question: Hi there, Is the window above the garage an attic? Also, for the flex space, could those walls be easily eliminated so that that was a formal dining room and not a separate space? Answer: Hello, The windows above the garage are in the floored attic space above the garage. There is no room up there. We do have a slightly larger version with a bonus room. See plan 59201. Yes, your builder could very easily eliminate the walls around the flex space by adding large cased openings, or beams with one support column at the corner. That is an easy site change. Thanks. Question: Do you have this house on a larger scale? Maybe around 2500 sq foot? Answer: See plan 59939 for a 2284 s.f. version, and plan 59206 for a similar, 2447 s.f. version. Thanks. Question: How do you vent the clothes dryer? up the wall, through the attic over the storage room, and exit out the side of house? or through the wall, and straight up through the roof? Answer: The dryer vent can be vented several ways. It could go down into the subfloor, then over to the front wall of kitchen and out there below floor level. It can be placed under the storage room slab, in a straight line out the left side, which is the best solution, with the shortest vent length, and least amount of back pressure. You could also run in through the wall into the rear of the storage room, just above the floor level and then into the elevated area between the basement stairs and left exterior wall. The vent pipe could be hidden inside trim very easily there, and would only take about 6" of space at the bottom. If you change the storage room floor to have a basement under it too, then the easiest way would be to run the duct into the subfloor, and straight out the left side. Shorter ducts are better. Less turns in the duct are desirable. Have a good day. Question: Hello! How wide is the entry way from the great room into the eating/kitchen area? Could the back porch and back wall (great room/eating area) be extended 2 or 3 feet easily? (I.e. Great room 16-8 x 16, eating 12 x 11-4). Thanks! Answer: Hello, The opening between the kitchen/eating area and great room is 8' wide. It could be wider if you wish. Yes, its possible to add 3' depth to the eating/great room by shifting the rear porch back. We can modify the plans as requested for $450 in addition to the purchase of the plan package. Allow 4 to 5 working days for preliminary plans, and another 6 to 10 working days for final plans. Thanks. Question: Is there a smaller version of this plan? Answer: We would like to recommend looking at house plan #s: 59206; 59939; and 59954. These plans are really similar to the plan that you are asking about without having so many modification costs to get closer to 2800 sqft. If you still do not like any of these suggested plans and still would like a quote then please let us know and we will send you one. Question: For the wall dividing the Great Room and Hall, with the entryway as-is would there be room for centering a wall-mounted TV perpendicular to the Vault or could that entryway shift in the direction of the Covered Porch to allow this sort of installation? With the Master Bath, would the existing Jet Tub location dimensions work for a tiled, walk-in shower and the existing Shower location dimension work as a pedestal tub? Thanks! Answer: Hello, We are the designer of this plan you found at www.FamilyHomePlans.com. The fee would be $450.00 in addition to the purchase of the 5 set or the PDF plan package. Designer's Notes: 1) Add 2' to redesign Master Suite. 2) Shift Case Opening down in the living room. When you are ready to proceed, please call the website to place your order for the plan package. Be sure to tell them that you are having modifications done by the designer. They will process the order, and send a copy to us. We will then proceed with preliminary plans for your review. We would request payment for the modification fees when we complete the work. Please allow 4 to 8 working days for preliminary plans, and an additional 10 to 15 working days for final plans to be completed. 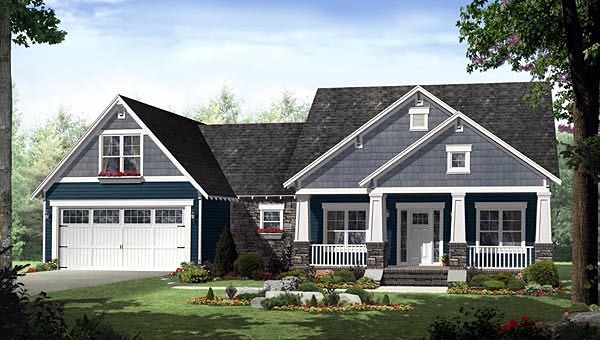 Amanda ----------- House Plan Gallery, Inc. Special Note: Customized materials list are not included in this quote. If you purchase the online material list, it will match the ORIGINAL plans NOT the customized set. We do not offer customized materials list at this time. Local builders and carpenters are the best source for those. Question: What are the dimensions of the Eating Area windows? Answer: Hello, The eating room windows are each 32" wide by 72" tall. 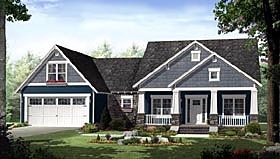 Question: Does this floor plan have the potential to have a bonus room above the garage? Answer: Hello, See plan 55600 for the raised slab version of this same plan. It has the basement stairs removed. You can replace the flex space/great room wall with a beam easily. That can be done onsite. Thanks. Question: How high is the vaulted ceiling? Answer: 14'-8" at the peak. Question: Is there a fireplace anywhere in this house? Answer: Hello, There is no fireplace. One could be added in the great room, in the rear right corner, or rear wall, or wherever you want. They take up about 5 to 6 feet width, and about 2 feet deep. Thanks. Question: Is there a bonus room above garage and if so where is the stairs to access them? Answer: Hello, There is no bonus room. There are only windows in the attic. Question: Is the roof load good for northern Michigan? The plan comes engineered for NO snow load, so that wont work for Northern Michigan as is. If you plan on using roof trusses, the local truss company will design the trusses to meet your local needs for free. If you plan on using regular lumber to "stick frame" the roof, then the size and spacing of the rafters just needs to be changed to match your snow load. Not a big deal either way. Thats easy to change onsite. If using trusses, the truss company will send a truss plan showing every truss and its location, based off the house plans. Click Here to download a free PDF Brouchure of Plan Number 55603.